Online Net Banking gives a user the freedom to transfer money anywhere and anytime. 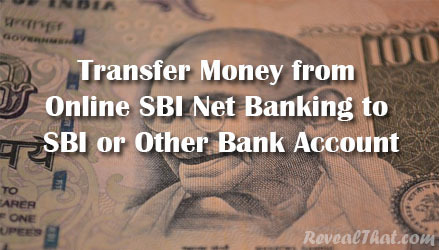 To transfer money through net banking you will just need to have an account in SBI Bank with SBI Net Banking Facility with transaction rights enabled. And if you are having these things ready with you than you are set to transfer money/ funds from Online SBI Net Banking to SBI or other Bank Account. Below are the steps which will help you to Transfer Money from SBI Net Banking to SBI or Other Bank Account. Login to your Account through Online SBI. Upon logging in to your Online SBI Net Banking Account to transfer funds or money from your SBI Account to others SBI or other Bank Account you will have to add beneficiary for which you will need bank account details including name, account number, address, IFSC Code etc. So now to add beneficiary you will have to navigate to Profile > Manage Beneficiary. Once you are at Manage Beneficiary, to Transfer Money from your SBI Account to other SBI Account you will have to select Intra-Bank Beneficiary or if you want to transfer money from your SBI Account to other Bank Account you will have to select Inter-Bank Beneficiary. Select which one suitable for you, in my case I am transferring money from Online SBI Net Banking to Central Bank of India so I will have to select Inter-Bank Beneficiary. After selecting suitable category from Manage Beneficiary, you will have to add beneficiary bank account details which includes Name, Account Number, Address, Transfer Limit, IFS Code, accept it and submit. Once you submit you will be getting message Mr.____ has been added successfully as your Beneficiary. You have to approve this beneficiary in order to make an Inter-Bank Transfer. Approve through OTP**: Using OTP (One Time Password) approval will happen after a cooling period of some hours, and maximum initial limit will be Rs. 50,000. Only one beneficiary can be added per day using this option. From these two option select second one that is Approve through OTP, after selecting you will get navigated to approve page select the payee from the list and below in the Enter High Security Password enter the OTP which you have received on your registered mobile number and click on approve. After successfully approving beneficiary the bank will activate your added beneficiary on the same day within 4 hours if you had approved your beneficiary during the period from 6.00 AM to 8.00 PM (IST). And once the added beneficiary gets activated you can proceed to next step. After the beneficiary gets activated by the bank, just navigate to Payments/Transfers > Inter-Bank Beneficiary (note: if you are transferring money from your SBI Account to other SBI Account you will find the added beneficiary to transfer the funds in Accounts of Others). In the next screen select options from transaction type from State Bank Group (Transfer amount upto Rs.5 lacs to beneficiaries holding accounts in associate banks of state bank group) or RTGS (minimum amount for RTGS transaction is Rs.2,00,000) or NEFT (no minimum amount transaction for NEFT) so select the transaction type in my case I have selected NEFT as my transaction amount is not above Rs.2,00,000/- and click on proceed. Next you will have to select the beneficiary name and enter the amount to be transfer, remarks is an optional field you can put anything in it as the remarks will be visible to beneficiary account statement and then accept the terms and conditions and click on submit button. The amount will get credited into beneficiary account within 2 hours during working hours of the bank. And if you have transferred money during non-working hours of the bank than the amount will get transferred on the next working day.